More than just a bus compressor, this fine-sounding and afordable debut from Cytomic deserves to be a hit. Great-sounding SSL emulation. Sidechain filter. Responsive metering. Easy interface. Mix and Range add flexibility. No automatic makeup gain. Windows RTAS version not ready. There are numerous options for those seeking a virtual imitation of SSL's famous hardware bus compressor, including Universal Audio's 4K Buss Compressor, the Waves 4000 Series bundle, and, of course, the official Stereo Bus Compressor for SSL's own Duende DSP system. 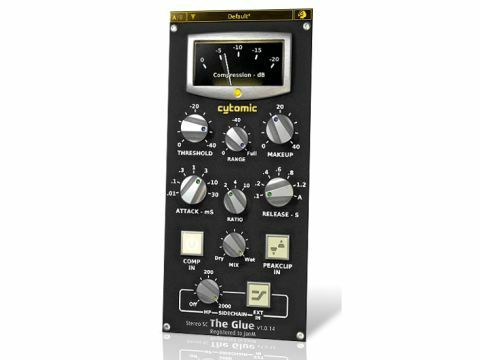 But these are all pretty expensive, so the arrival of Cytomic's effort, The Glue, at a very reasonable $99, certainly caught our attention. Being a non-endorsed imitation, The Glue is free from the requirement of rigorously replicating the original, and Cytomic has taken the opportunity to include some additional features that you won't find on the real thing. For The Glue, this means additional Range and Mix controls, a PeakClip option and a sidechain feature with external and low-cut options. The only minor omission is automatic makeup gain. On the face of it, then, if this plug-in actually sounds like an SSL, Cytomic may have trumped the big boys. So, back to the basics. The Glue aims to follow SSL's original E and G Series bus compressors, and this has been achieved through component simulation. The plug-in is cross-platform, in VST, AU and RTAS formats (although RTAS for Windows is still in development), and it's intended to be as CPU-efficient as possible. If you're familiar with the SSL original, you'll recognise features such as 'auto' release, three possible compression ratios (2:1, 4:1 and 10:1) and the exact same attack times. However, there are some differences, including a super-fast 0.01ms attack option and extra release times (0.4 and 0.8s), while the original 0.3s release time is labelled here as 0.2s. Threshold, makeup gain and the meter have also been given new names. On the bench, we set up a couple of our favourite SSL settings (subtle pumping mix compression with a 2:1 ratio and a more aggressive setting for drum kit processing), and both had that familiar sound, comparing very well to Universal Audio's 4K Buss Compressor. So, what of the 'new' features? First up, the sidechain filter affects both internal and external sidechain signals and enables you to roll off low frequencies right up to 2kHz. This works well at reducing pumping on mixes, but also helps with fine-tuning compression for low-end heavy sounds, such as basses and kick drums. Next up, both the Mix and Range controls add a host of options for dialling in the compression flavour, and in practice we found this made The Glue an incredibly flexible compressor suitable not just for use on the master bus, but for individual instruments too. Finally, the PeakClip option with its associated red LED is useful if used carefully, though it shouldn't be confused with analogue-style soft saturation, as it will produce harsh distortion if pushed too far. The Glue is a world-class plug-in and, at $99, we reckon it offers amazing value. Factor in the extra options and you have a very tidy and useful compressor with more real-world uses than the design it's based on. 1. Drum kit: starting with a basic 2:1 ratio, medium attack and release adding more compression by reducing the threshold until the sound is very squashed. Then gradually easing back the mix. Then gradually easing back the range as well. Finally, switching back to wet mix and between zero range (loud) and full range (compressed). 2. Kick drum: starting with medium attack, fast release compression gradually winding up the sidechain filter ending at around 300Hz. 3. Snare drum: starting with medium attack, fast release, adding compression then winding up the sidechain filter ending around 800Hz. Bypassing the compressor to compare. 4. Acoustic guitar: introducing quite heavy compression with medium attack and auto release, then blending back the dry signal using the mix control. Finally, bypassing the compressor for comparison.